Every year I promise to share The Absolute Best Prime Rib Recipe and every year I forget to take pictures. This year I’m making prime rib AND sharing the recipe!! Not only am I the worst at promising to share The Absolute Best Prime Rib Recipe with you all, but I’m also the worst at remembering to do it well in advance so you can be ready for the holidays. I promised myself to get it done early this year and this is good enough, right? And because I’m super fantastic, I’m also going over a lot of tips, tricks and things to avoid so that it turns out absolutely perfect for you!!! I don’t know what it is about prime rib, but you throw that out there and people seriously come running. I was actually talking to my mom on the phone while I was shooting this recipe and sure enough, “Oh, what I wouldn’t give to be there!!!!”. Part of it is that the meat is so incredibly tender, juicy and dare I even say buttery that you just can’t help but love the heck out of it. Oh but for me that’s not even the best part. I’m all about the outside. It’s all caramelized and packed full of flavor. I’m telling you, it’s like the burnt ends on a brisket. It’s so, so good!!!! Generally speaking, prime rib is served rare to medium rare, but I’ll be honest, I like mine more like medium. It’s entirely up to you and I’ll put all of the different temps and times below. I’ve messed up enough Prime Rib recipes to know exactly what you should and shouldn’t do. So let’s jump right in there and get cookin’. Standing Rib Roast and Prime Rib Roast are the same exact same thing. It’s just that different people call them different things. A prime rib is a cut of beef from the primal rib, one of the nine cuts of beef. While the entire rib section comprises ribs six through 12, a standing rib roast may contain anywhere from two to seven ribs, just depending on what you buy as there are options! Not all stores, in fact most stores don’t sell very high quality Prime Rib cuts. The first thing you should do is head to a butcher that you trust. 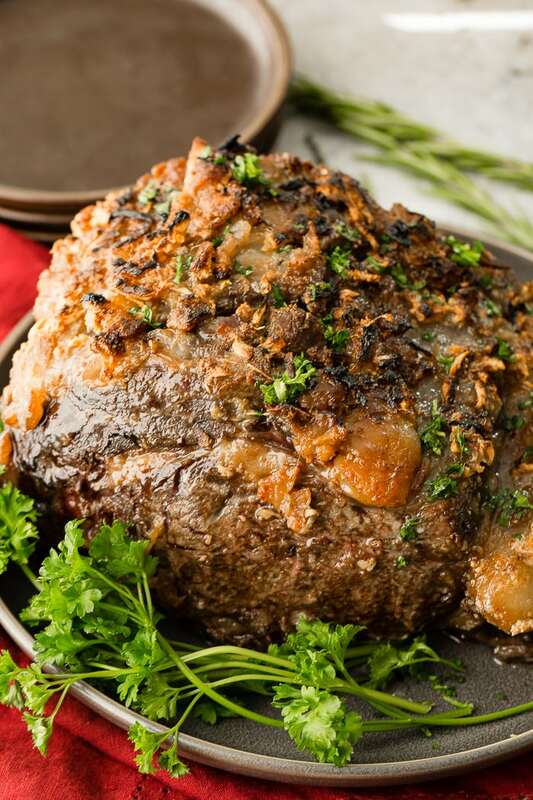 Look for a prime rib roast with an untrimmed fat cap (ideally ½ inch thick). We prefer the flavor and texture of prime-grade beef, but choice grade will work as well, just ask the butcher which he has. If possible, buy a prime rib roast that has the bones attached. This isn’t always the case and you’ll be fine if they aren’t, but tying the ribs to the meat will give you a more even, juicy roast versus boneless. It’s so hard to know how much meat people are going to eat. I like to use the rule for prime rib of about 1 pound per adult. How much prime rib for 8- A 4-bone prime rib will feed eight to ten people. How much prime rib for 20 adults- An 8-10 bone prime rib is better for 20 people. To remove the bones from the roast, use a very sharp knife, we prefer to only use Wusthof, and run it down the length of the bones, following the contours of the roast as closely as possible until the meat is separated from the bones. Overnight salting is the most important step for prime rib. Others may try to fool you into thinking it’s the resting stage, which is up there for sure, but it’s not number 1. Rub a good quality Kosher salt all over the meat the day before you want to cook it. 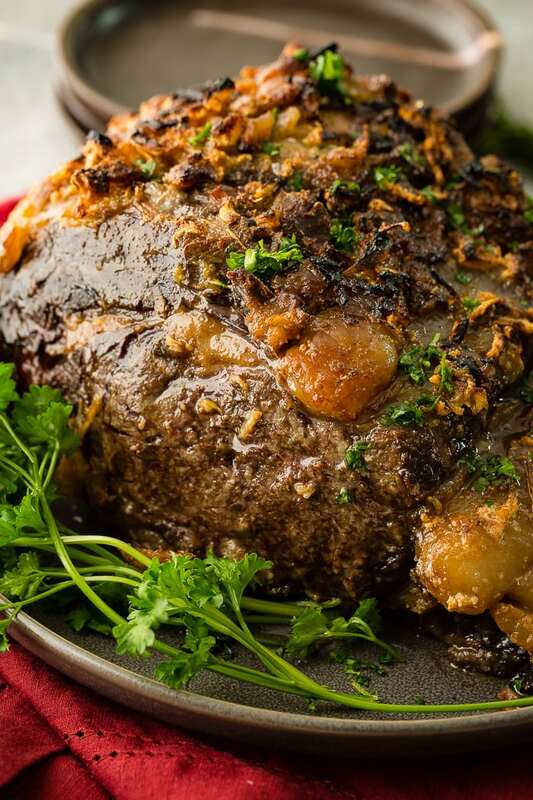 Now, place it in the refrigerator overnight, UNCOVERED in order to enhance the beefy flavor while dissolving some of the proteins, which yields a buttery-tender, juicy roast. Take it from me, a prime rib is stressful the first time you make it. Well, if you haven’t been given any tips or tricks. I was super worried about undercooking the prime rib roast so I checked it too often. This was lengthening the cooking process and ended up cooking it over medium temperature. Monitoring the roast with a meat-probe thermometer like this, Thermopro is best. If you use an instant-read thermometer like this Thermopro Instant Read, open the oven door as little as possible. Also, remove the roast from the oven while taking its temperature, so you aren’t letting out extra heat. If your roast has not reached the temperature you wanted in the time range specified, heat the oven to 200 degrees, wait for 5 minutes, then shut it off, and continue to cook the roast until it reaches the desired temperature. Why is Prime Rib so Expensive? Oh, I’m so with you, why is prime rib roast so expensive?! The more marbling, the more flavorful it will be. A full prime rib is cut from the 6th through 12th ribs of the cow, so seven ribs in total, meaning you are getting quite a lot of meat and bones. It’s one of those cuts that ends up extra work for a butcher and extra juicy for you, also making it more expensive. What Temperature to cook Prime Rib to Well Done- 140-145°F, it is well done. 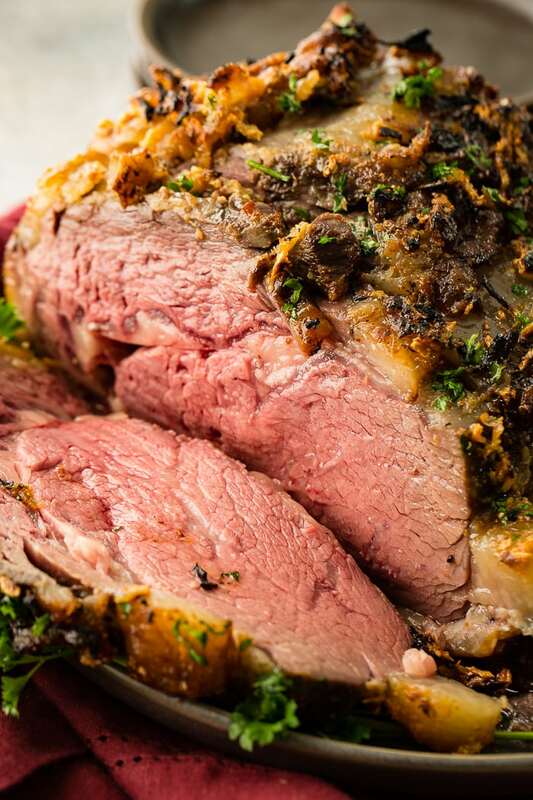 Are Prime Rib and Ribeye Roast the Same? The “Prime Rib” is basically just a marketing term. It refers to a standing rib roast from that section or cut. The Rib Eye Roast is a rib roast that has been carved off of the bone. It is the same piece of meat as a standing rib roast. 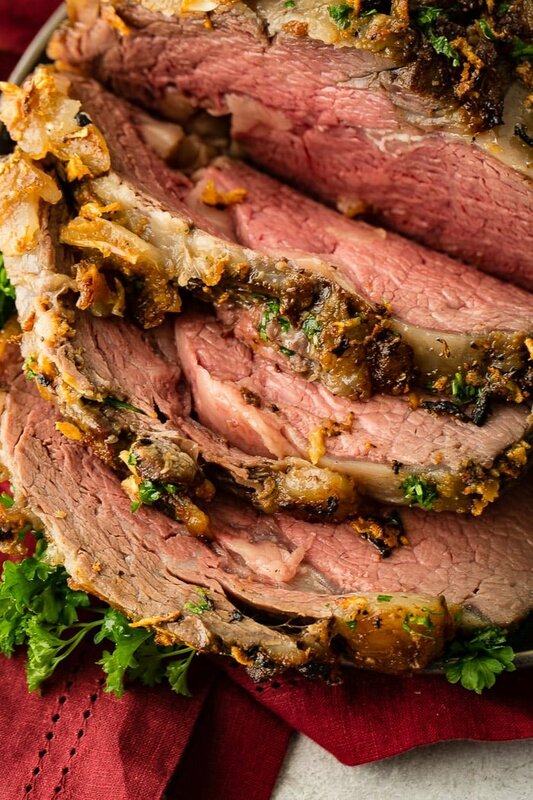 One of the most important steps in perfecting the prime rib is to give it time to rest. This is after you remove it from the oven and before serving it to your guests. Heat drives juices toward the center of the meat. Think of when you cut into a steak that hasn’t rested and the juices all run out and it’s chewy versus at a restaurant where you notice that it’s perfectly distributed. A rest gives juices the chance to redistribute themselves. You’ll want to loosely tent the meat with foil and let it rest for 20- 30 minutes before carving. Looking for more HOLIDAY recipes? Here’s an entire list: Award Winning Instant Pot Turkey, Cade’s Bananas Foster French Toast, Orange Cinnamon Butterflake Rolls, Instant Pot Blueberry French Toast Bake 3 Ways or Candied Pecan Brussel Sprouts, Mom’s Sticky Buns, The Best Potato Rolls, World’s Best Brown Sugar Ham. Or if you want a different beef recipe, try this Corned Beef Brisket! Every year I promise to share The Absolute Best Prime Rib Recipe and every year I forget to take pictures. This year I'm making prime rib AND sharing the recipe!! Using a very sharp knife, cut slits in the outer surface layer of fat, spaced 1 inch apart, in cross pattern, much like crossing on a baked ham. Do not cut into the meat. Gently slice down through the meat, following the bones to remove them from the meat. Do not discard. Rub 2 heaping tablespoons of Kosher salt over entire roast and especially rub it into the slits. Place the meat back on bones and onto a plate. Refrigerate the meat, uncovered, at least 24 hours and up to 96 hours. Place the meat on the counter to rest for 2-3 hours so it takes the chill off. Adjust the oven rack to a middle position and heat the oven to 200 degrees. Heat oil in 12-inch skillet or dutch oven over high heat until smoking. Sear sides, top and avoid the bottom of the roast where you removed the bones (reserving bone on the plate). Place meat back on rib bones, so bones fit where they were cut, and let cool for 10 minutes so you can touch it; tie meat to bones with 2 pieces of twine between the ribs. Transfer the roast, fat side up, to a wire rack set in a rimmed baking sheet and season with pepper. Mix the butter and garlic in a bowl, and rub it all over the meat. Roast until meat registers 120 degrees, 3 1/2 to 4 1/2 hours. Turn off the oven; leave the roast in oven, opening door as little as possible, until meat registers about 120 degrees for rare or about 125 degrees for medium-rare, 135-140° for medium, and 140-145°F for well done, 30 to 75 minutes longer. Remove roast from oven (leave roast on baking sheet), tent loosely with aluminum foil, and let rest for at least 30 minutes and up to 75 minutes. Adjust the oven rack about 8 inches from broiler element and heat broiler. Remove foil from the roast. Broil until top of roast is well browned and crisp, 2 to 8 minutes. Transfer roast to carving board; cut twine and remove roast from ribs. Slice meat into 3/4-inch-thick slices. Season with coarse salt to taste along with any drippings turned to gravy, and serve.